Taiwan, as one of the jurisdictions comprising the so-called “fourth wave of democratization,” fundamentally altered its criminal justice system over the course of just decades. This was particularly true with respect to the rule of law and the procedural law around the exclusion of evidence. For example, although illegally obtained, or “tainted” evidence may be crucial in the search for the truth, it is to be excluded if it was obtained under certain circumstances, including torture or coercion. The legal theory behind this area of Taiwanese law is grounded in the common law criminal justice system, although Taiwan has developed its own procedures and remedies. How illegally obtained evidence is excluded in Taiwanese criminal procedure is discussed, as is the melding of the Thai approach with its theoretical basis in Anglo-US criminal procedure. Both practical and theoretical perspectives are explored and the gaps between the formation of legislation and its enactment into judicial practice are addressed. Taiwan’s legal system is committed to the rule of law as well as to respect for human rights. It bridges the legacy of Chinese law from the penultimate century with modern legal rules. With regard to the criminal justice system, and more particularly with regard to fact-finding in criminal proceedings, Taiwan’s Code of Criminal Procedure (CCP: 刑事訴訟法1) obliges the authorities to search for the truth, while protecting human rights at the same time.2 These principles also translate into the making of exclusionary rules: While all authorities are bound to search for the truth in a criminal investigation (Art. 2 of the CCP3), they must not put the search for truth above all other considerations.4 The Taiwanese criminal justice system sets clear limits with the provisions of the CCP.5 Therefore, criminal proceedings may not be initiated and punishment may not be imposed other than in conformity with the procedure specified in this Code or in other laws. Taiwan’s CCP was enacted in 1928.12 At first, it was published and implemented in mainland China as first Code of Criminal Procedure in the Republic of China (ROC). After World War II and further struggle with the Communist Party of China, the government of the Republic of China relocated to the island of Taiwan which, at that moment, was not longer colonized by Japan. The Republic of China brought its legal system to Taiwan, including the CCP, whereas all former laws were abolished in mainland China after proclamation of the People’s Republic of China (PRC). The commitment that criminal proceedings primarily serve the ascertainment of truth is reflected in various provisions of the CCP: First of all Art. 2 para. 1 of the CCP obligates public officials investigating a criminal case to give equal attention to circumstances both favorable and unfavorable to a defendant. This means that the investigation is conducted open-mindedly and authorities are bound to objectivity, in order to discover the truth and thus not wronging innocent individuals or condoning offenders.13 In that respect, Taiwan’s Criminal justice system is more based on the inquisitorial model, as found in Continental Europe, than the adversarial system, as found in England or the United States. Despite the fact that prosecution authorities have the obligation to search for the truth and to investigate all circumstances of a case, both unfavorable and favorable for the defendant, it is naturally difficult for a prosecutor to always stay impartial and detached while collecting evidence. Therefore, the defendant and the defense counsel have rights of their own in order to ensure a fair trial. Taiwan’s CCP grants defendants various procedural rights, placing an overall limitation on the powers at the disposal of the investigating authorities. Audio and, eventually, video recording of the interrogation of the defendant must be in its entirety according to Art. 100-1 para. 1 of the CCP. Additionally, in order to document that a defendant’s interrogation is conducted according to the rules and a possible confession is based on free-will, Art. 100-125 of the CCP provides that the whole proceeding of examining the defendant shall be recorded without interruption in audio, and also, if necessary, in video. The effect of a violation is then provided for in Art. 100-1 para. 2. If there is an inconsistency between the content of the record and that of the audio or video record regarding the statements made by the defendant, any such portion of the statement shall not be used as evidence. Of course, if the criminal investigation authority informally talks to the defendant about the case and press for a confession of the crime prior to the “official” recording, the purposes of all these specific measures for the interrogation are rendered void and the safeguards can be circumvented. The handing of a case in the Taiwanese criminal procedure can be divided into four stages: the police investigation stage, the prosecutor investigation stage, the court trial stage and, if a guilty verdict is rendered, the enforcement of a judgment. The police and prosecutors’ investigations are so called pre-trial investigations. According to the Taiwanese model, prosecutors are in charge of supervising the police, who do the main body of work during investigations.26 After the police have finished their investigations, the case is handed over to the prosecution service. The competent prosecutor decides whether the requirements for an indictment are met or not. If a case is prosecuted, it will be referred to the court and, until this stage, the potential for evidence to be excluded plays a role. Generally, a criminal case is run by the normal three-tiered judicial system, i.e. prosecuted at a District Court in first instance, the High Court, and the Supreme Court. If a conviction is final, the prosecutor of the competent court shall perform the execution of the judgement. Furthermore, due to the requirement for courts to seek the truth (see Art. 163 para. 2 of the CCP), people often state that, “judges are doing God’s work.” (法官在做神的工作).27 Prior to amendments on February 8, 2002, Art. 163 of the CCP stipulated that due to the necessity of truth finding, courts “shall” ex officio investigate evidence. Although subsequently influenced by the adversarial system of US-American criminal procedure, the code still states “[t]he court may, for the purpose of discovering the truth, ex officio investigat[e] evidence” (Art. 163 para. 2 of the CCP). The stipulation that “for the purpose of maintaining justice or discovering facts that are critical to the interest of the defendant, the court shall ex officio investigate evidence” reflects the importance of fact-finding in Taiwan’s criminal justice system. Defendants are considered to be a subject rather than an object of criminal procedure in the Taiwanese criminal justice system. Among other entitlements, defendants are protected by the presumption of innocence29 and the privilege against self-incrimination (Art. 95 para. 1 CCP; Art. 14 para. 3 (g) of ICCPR). Furthermore, defendants have a right to assistance by a defense attorney (see Arts. 27 and 34 of the CCP). A defense attorney, in theory, plays an important role in Taiwan’s CCP and should, in a situation of equality of arms, make use of defense rights to safeguard the defendant’s interests. In practice, however, compared to the power of the prosecution authorities, there still appears to be a lot of room for improvement to empower defense lawyers in Taiwan30 if the goal is ultimately to reach an equality of arms. In criminal proceedings, striking a balance between the search for truth and the protection of civil liberties (particularly those of the defendant) has been a longstanding and difficult issue. From the perspective of the Taiwanese CCP, discovering the truth has always been an extremely important value. Fortunately, during the last decades, compliance with the legal requirements for obtaining evidence has generally improved in Taiwan, which could make for balance, at least on the surface; if a violation of such procedural requirements takes place, criminal defense attorneys today advocate for the exclusion of illegally evidence.31 However, such pursuits by defense lawyers still occasionally draw public criticism, since the search for truth is held in much higher regard than the protection of individual rights (particularly those of the defendant). Due to tradition, in the eyes of the public a confession by a defendant is still one of the most important proofs of guilt. Aside from very few exceptions, in practice, if a defendant confesses a crime, judges will not be open-minded, but handle proceedings with prejudice against the defendant. The existence of a confession directly affects how proceedings are conducted (such as whether to start a cross-examination or a more onerous investigation for evidence, etc.) and how they ought to be concluded (such as whether to proceed with plea bargaining procedures and quickly terminate legal proceedings). Taiwan’s public has considerable interest in criminal cases, which are featured in daily press and other media on a regular basis. The second category of violation is the leaking of investigation secrets by investigators for media exposure. These types of violations primarily occur due to the poor practice of evaluating the performance of investigators by the amount of media exposure their prosecuting cases receive. This tendency is especially evident in publicly witnessed cases, such as when the accused parties reveal their actions to the public, or voluntarily accept media attention. Due to the intense amount of attention given to publicly witnessed cases by the Taiwanese media, and the broadcasting of the confessions of the defendant (possibly through interviews by anonymous investigators or the media raises questions during the transfer of the defendant), public opinion on the guilt of the defendant is often formed without consideration of the due process of law (public judgment). Such public opinion often only recognizes subjective evidence, while disregarding objective evidence showing inconsistencies between motive and legality. Although the implementation of legal restrictions on the disclosure of evidence through confessions by accused parties through the media have yet been established, if the court holding a specific trial finds the defendant not guilty based on evidence unrelated to the public confession of the defendant (see Art. 156 paras. 1, 2 of the CCP), then the court judgment naturally comes into conflict with the opinion of the public. As in the case in Taiwan, high profile criminal cases are a focal point of front pages of newspapers and, ever increasingly, on social media. Even at the early stages of an investigation, sometimes even before prosecutors begin their investigation, criminal cases are the focus of public discussion and speculation. After a case is brought to court, all the way along to the stage of enforcing the judgment, the proceedings are repeatedly discussed in the media. In more conservative newspapers, the focus is mainly on the various cases that heavily influence the political situation or directly influence people’s lives. In addition, new electronic newspapers and real-time news, which are not bound by space restrictions, keep a close eye on news of interesting cases and include information of various kinds relevant to the criminal case. Moreover, readers interactively comment, deepening the discussion on these criminal cases. Such information policy is two-edged: While it informs the public, albeit, once a specific atmosphere has been created (possibly helping to convincing the public that the defendant is guilty), it sometimes does not aid in finding the truth, but actually does the opposite. Newly-emerged social media (such as Facebook, Line, Twitter, etc.) combined with the widespread use of smartphones and other electronic devices have drastically increased media coverage of criminal cases in terms of range, depth and speed. Due to the preference for text-based narration, the content quality of traditional media is substantially higher than that of electronic media. However, there are not many readers who like long in-depth reports. Fast-paced reading habits limit the ability to reflect deeply and decrease the desire to explore the truth. Also, the division between the opposing views of the social community reduces opportunities for exchange. The desire and possibility for dismissing preconceived ideas and exploring the truth is therefore also limited. As for case decisions in criminal justice practice, there is relatively little discussion in the legal world on whether or not they are influenced, to a certain degree, by the media described above and little discussion on corresponding legal regulations. How to ensure that erroneous information among the many opinions does not influence judicial decisions and follows the principles of oral trial and direct trial, and ensure that the prosecutors and judges pass judgment, in accordance with the principles of law and evidence rather than deliberately following or opposing public opinion, is an important issue which needs to be urgently solved in Taiwan’s current criminal justice system. Even before exclusionary rules were adopted in 2003, the Supreme Court had already made it clear that “if authorities in a criminal proceeding present wiretap transcripts as evidence, the transcripts shall be excluded if the wiretapping fails to meet the legal requirements and gravely breaches privacy and/or the freedom of correspondence as protected by Art. 12 of the CRC; in order to deter unlawful investigative methods, it would be inappropriate to use such information as evidence.”42 This decision is one of the rare cases in which a court discusses the admissibility of evidence; according to this decision the exclusion of evidence depends on a balance of the severity of the breach of legal rules when collecting the evidence and the probative value, with a proportionality test eventually deciding on the exclusion of such evidence. This case law followed the adoption of a balancing approach in 1999, when the Supreme court held that “when deciding whether a piece of evidence that was collected illegally should be excluded, the court must first consider whether the admission of such evidence would jeopardize fairness and justice. A comprehensive assessment that includes consideration of the spirit of the Constitution, the severity of the violation of procedural rules and the damages caused by the crime shall determine whether such evidence must be excluded in order to conform with fairness and justice.”43 In 2003, the newly amended Art. 158-4 of the CCP followed the rationale of this case law, which sets the current legal framework for the exclusion of evidence. As has been pointed out above, all information relevant for fact-finding in a criminal case is admitted as evidence in a criminal trial in Taiwan. Nevertheless, the CCP also provides explicitly for the exclusion of evidence. An important feature of Taiwan’s framework for the exclusion of evidence is thus its stipulation by a legal rule, rather than by case law. Its origin lies with the Judicial Yuan (司法院)44: In 2003 the Judicial Yuan proposed a revision of the CCP to the Legislative Yuan (立法院).45 The new law stipulates certain circumstances for mandatory exclusion of evidence obtained illegally, e.g. Art. 158-2 of the CCP. Furthermore, the law sets a general rule—Art. 158-4 of the CCP—for a case-by-case decision in certain situations, including when the evidence was “obtained in violation of the procedure prescribed by the law by an official in execution of criminal procedure”, balancing human rights protection and public interest. These exclusionary rules were adopted in September 2003. According to the current law, when the procedural rules are violated, two forms of evidence exclusion rules exist: Specific (obligatory) exclusionary rules (Arts. 156 para. 1, 158-2 of the CCP) and general (relative) exclusionary rules (Arts. 158-2, 158-4 of the CCP). The following is an introduction of the evidence exclusion rules of the CCP. It will be separated into these two parts. The lawmaker appears to especially mistrust confessions obtained during the night or while a defendant is in jail. It is against this backdrop that one must read the different provisions regulating the exclusion of confessions, especially specific constitutional law and the key provision of the CCP: Art. 158-2. According to Art. 8 para. 2 of the Constitution of the Republic of China (CRC),47 when a person is arrested or detained on suspicion of having committed a crime, the organ making the arrest or detention shall, within 24 h, turn him over to a competent court for trial. The 24 h limitation refers to the actual time that can be used for investigation. Art. 93-1 of the CCP48 provides reasons of delay that shall not be counted in the 24 h time limitation. These reasons include: the time used for transferring the defendant, the time used to wait for bonds to be presented or for the acceptance of custody, the time when being examined by the court, unavoidable delay caused by traffic or force majeure, examination not being possible due to health related emergency suffered by the defendant, the examination not going ahead due to no defense attorney, an assisting person authorized by law or an interpreter being present. To respect human rights and to ensure the legality of these procedures, there shall be no examination or interrogation conducted should these circumstances prevail and at night. Otherwise the testimony collected is, in principle, inadmissible. Taiwanese law grants the defendant the right to remain silent and the right to have a defense lawyer. Art. 18-1 of the Communication Security and Surveillance Act (CSSA: 通訊保障及監察法) provides that any content acquired through communications surveillance enforced in accordance with Arts. 5, 6 or 7, or any evidence derived from such surveillance that is not related to the purpose of the surveillance, shall not be used as evidence or for any other purpose in any judicial investigation, judgment or other proceeding. The information obtained by applying torture or coercing the defendant is to be mandatorily excluded and is, accordingly, inadmissible as evidence in criminal trials in Taiwan (see Art. 156 para. 1 of the CCP). The Taiwanese criminal justice system clearly rejects torture (see. Art. 98 of the CCP, Art. 125 of the CCRC). However, one cannot find a clear-cut definition of torture or undue coercion in the CCP or in the Criminal Code of the Republic of China. Art. 8 of the Constitution of the Republic of China does enshrine personal liberty as being one of the most fundamental rights against undue physical harm or improper detention. However, the wording of the Constitution article is extremely concise. As in most criminal justice systems, Taiwan has special rules for evidence obtained by torture or undue coercion. The law excluding involuntary statements made by the defendant has basically been set by the Taiwanese judiciary—including district courts, high courts and the Supreme Court. The legal reasoning of Taiwanese courts is generally extremely short and simple, maybe due to the tradition of conciseness in Chinese literature. But in some cases the Supreme Court explained specific issues more detailed. Following are three explanations given for a possible exclusion of evidence. This reasoning also highlights the rationale behind exclusionary rules—from the point of view of the courts. The Supreme Court expressed in another case involving illegal search activities that exclusionary rules are based on constitutional requirements and are intended to have a deterrent effect: By excluding evidence illegally obtained by law-enforcement agencies due process will be upheld and the police will be deterred from illegal activities in collecting evidence.77 This explanation can be seen as a general statement, an effort to underpin the application of all exclusionary rules (not only those related to illegal searches). Apart from the exclusion of the improperly obtained evidence,81 the victims of torture or similar improper means of investigation which violate Art. 98 of the CCP82 are entitled to financial compensation for the injury or damage they suffered or the loss of freedom caused accordingly, following the State Compensation Law (國家賠償法83) or the Law of Compensation for Wrongful Detentions and Executions (刑事補償法84). The policemen, investigators, or prosecutors who are liable for such wrongdoing may be prosecuted. They may be sued—also by the State—and asked to reimburse the payment already made by the Government to the victim. In addition, the liable law-enforcement officers and/or prosecutors may also face administrative disciplinary measures. Based on a principle of judicial interest balance that underlines Art. 158-4 of the CCP, the Supreme Court adopted a discretionary exclusionary standard for dealing with the evidence generally known as the fruit of poisonous tree doctrine. Thus is held that “unlike the American practice that excludes tainted evidence derived from previous illegally obtained evidence, a different approach is taken in this country. Namely, while the secondary evidence derived from the previous improperly obtained evidence should be excluded, the evidence acquired by an independent legitimate investigation shall not be suppressed.”86 It appears that, as the Court tried hard to draw a distinction from the American fruit of poisonous tree doctrine, the previous ruling in fact makes differs little from the local ruling because the American fruit of poisonous tree doctrine also bears certain exceptions and renders itself far from a mandatory rule of exclusion. Empirical research on crime and statistical criminal information have both always been neglected areas in Taiwanese criminal law. These are not only relevant topics for academic research or studies of interest; even the judicial statistics of the authorities91 and statistical reports created by the Judicial Yuan92 put special emphasis on items such as the number of criminal cases received and finalized. Therefore, exclusion of evidence or evidence material are both lacking as specific research topics or statistical items. The contents of Taiwanese criminal judgments (not including prosecution investigation documents, such as indictments or non-prosecutorial dispositions), apart from specific documents prohibited from disclosure, can in principle be found on the Judicial Yuan’s Law and Regulations Retrieving System93 or private judicial databases such as Lex Data.94 Using the words “exclusion of evidence” (including “not to be used as evidence”, but also eliminated especially because of the hearsay principle) as a query, there are many results. If we just take the Supreme Court as an example, there are already more than three thousand query results. In District Courts, there are a number of times more. Therefore, more detailed and accurate proof and statistical information of evidence exclusion can only be found if exclusion of evidence becomes a subject for empirical research or research projects. Only when criminal judgments are extensively collected, analyzed, concluded and dealt with can there be a way. After the adoption of evidence rules, the Supreme Court frequently discussed issues arising from the difficult question of when evidence should actually be excluded in a specific case. This is an indicator of the importance attached to these rules. According to standing case law the admissibility of evidence shall be decided on the basis of factors including due process of law, the integrity of the judicial system and the deterrence effect for unlawful collection of evidence. Ultimately the exclusion of illegally obtained evidence is decided case-by-case, based on a balancing test, albeit a “relative exclusionary model”. Only if the law explicitly mandates the exclusion of evidence, there is no space for balancing. A search of the Judicial Yuan’s decision database gives the following result: From February 2003, when Art. 158-4 of the CCP was enacted until December 2015, the Supreme Court assessed 258 cases on possible exclusion of evidence using the balancing test. Among these cases, 155 cases were remanded because the lower court had failed to apply the balancing test in its decision. A total of 103 cases were upheld and in 95 cases the Court held that the evidence at stake was admissible and in only in 8 cases it opted for inadmissibility. The Taiwanese criminal justice system is still struggling to find the appropriate balance between truth finding and protection of individual rights when investigating crime and prosecuting a case. On the one hand, in order to find substantive truth, all relevant evidence appears to be needed, even if it is obtained as a result of the investigating authorities infringing human rights. On the other hand, not only the people, but also the government is bound by law and thus the rule of law is a principle to be followed by all official authorities. Each country handles this issue differently. The Taiwanese CCP provides defendants with various entitlements, including the right to counsel, the right to information, the right to an audio/video recording of any interrogation, the right to remain silent and exclusionary rules ensuring that the relevant individual rights in the criminal process are protected. Whether or, rather, how these rights are granted in practice is yet another question, as is the question of what remedies an individual has in cases of violation of these rights. The CCP’s exclusionary rules, adopted in 2003, were meant to safeguard the rule of law and judicial integrity. The lawmaker acted in the firm belief that an exclusion of evidence obtained through torture, undue coercion or other misconduct of the authorities will send a message—to the public and investigating authorities alike—that courts will condemn any lawless acts. Today, the Taiwanese CCP adopts a multitrack approach to the exclusion of evidence. In some cases, for example, the information obtained by applying torture or undue coercion to a defendant is to be mandatorily excluded and thus inadmissible as evidence in criminal trials (Art. 156 para. 1 of the CCP). In some other cases, the court is to balance the interest in finding truth and individual rights. The catch-all clause is prescribed in Art. 158-4 of the CCP to allow the court to exclude evidence illegally obtained after considerations. More than a decade after adopting exclusionary rules as part of the procedural law it appears that the rules are still a work in progress and pose, in fact, a challenge to the various stakeholders in the criminal justice system. It seems to be too early to decide whether exclusionary rules have proven to be effective tools in safeguarding human rights, while at the same time securing the search for the truth in a criminal case. Available online at <http://law.moj.gov.tw/LawClass/LawAll.aspx?PCode=C0010001>, officially translated as The Code of Criminal Procedure of 28 July 1928 (Status as of 12 December 2007), available online at <http://law.moj.gov.tw/Eng/LawClass/LawAll.aspx?PCode=C0010001>, accessed 21 November 2018. LIN Yu-Hsiung, 2013 (I) at 7–10; ZHU Shi-Yan, 2015 at 8. “Keine Wahrheit um jeden Preis. “In Taiwanese practice this is a general consensus, e.g. the interpretation No. 130 of the Judicial Yuan (22 December 1995) states: Although the state has the goal of finding out the truth in criminal justice proceedings, it does not mean that the state can attain this goal by whatever means available (國家為達成刑事司法究明案件真象之目的, 非謂即可訴諸任何手段). Art. 1 of the CCP clearly states that all criminal investigations and criminal prosecutions are bound by the rule of law. E.g. Supreme Court precedent 93 taishangzih No. 664 (最高法院 94 年台上字第 664 號判例) and Supreme Court decision 94 taishangzih No. 275 (最高法院 94 年度台上字第 275 號判決); WANG Jaw-Perng, 2011 at 8–10. In the law-materials the following factors are formulated: (a) the circumstances of the violation of the procedure prescribed by the law: must be taken into account of whether there were difficulties in collecting evidence lawfully; (b) the subjective intentions of the official: referring to whether the official knows that his conduct is unlawful; (c) the nature and the severity of the right that was infringed: referring to the circumstances of the infringement; (d) the risk and harm of the crime: referring to the nature of the crime and its circumstances; (e) the deterrence effect of excluding such evidence; (f) whether it is unavoidable that officials will discover such evidence using procedure prescribed by law: the standard may be loosened if such evidence can be acquired through normal proceedings; and (g) the effect of the unlawful evidence has on the defense of the accused. See also: LIN Yu-Hsiung, 2013 (I) at 593 et seq. About the detailed development see CHEN Yu-Jie, 2011 at 713–28; WANG Jaw-Perng, 2011 at 19–21. Nonetheless, in 2004 we have introduced the bargaining process, which is regulated from Arts. 455-2 to 455-11 in the CCP. The expert criticize that establishment of plea-bargaining does not base on truth, but on the admitted facts, see e.g. LIN Yu-Hsiung, 2013 (II) at 289–90. See Arts. 228 para. 1, 230 para. 2, 231 para. 2 of the CCP. Art. 163 para. 2 of the CCP. The exception is so-called Summary Procedure in Arts. 449 of the CCP (簡易程序): If a defendant’s confession in the investigation process or other existing evidence is sufficient for the court of first instance to determine a defendant’s offense, a sentence may be pronounced through summary judgment without common trial procedure upon request by the prosecutor; provided that the defendant shall be questioned before sentencing if necessary. See Arts. 154 para. 2, 163 para. 2 of the CCP. ZHU Shi-Yan, 2015 at 179. See with more details in 3 Limitations of Fact-Finding in Criminal Proceedings. Arts. 455-2 to 455-11 of the CCP. See LIN Yu-Hsiung, 2013 (II) at 254–55; ZHU Shi-Yan, 2015 at 577–79. LIN Yu-Hsiung, 2013 (II) at 287. Supreme Court decision 94 taishangzih No. 275 (最高法院 94 年度台上字第 275 號判決). See Supreme Court decision 94 taishangzih No. 275 (最高法院 94 年度台上字第 275 號判決). The literature consistently stands for the decision, e.g. LIN Yu-Hsiung, 2013 (I) at 202; ZHU Shi-Yan, 2015 at 178. See Art. 230 para. 1 of the CCP. Supreme Court decision 104 taikangzih No. 766 (最高法院 104 年度台抗字第 766 號裁定): “the judge is also a person, not God, of course he inevitably does something wrong.” (法官也是人, 不是神, 當然難免絕對無錯). See Annex. The text is available online at <http://law.moj.gov.tw/LawClass/LawContent.aspx?PCODE=C0000001>, officially translated as Criminal Code of the Republic of China of 1 January 1925 (Status as of 13 June 2018), available online at <http://law.moj.gov.tw/Eng/LawClass/LawContent.aspx?PCODE=C0000001>, accessed 21 November 2018. See Art. 154 para. 1 of the CCP. WANG Jaw-Perng, 2011 at 19–21. In practice, during the investigation process in Taiwan, considerations are made to ensure smooth proceedings or prosecution, resulting in the tipping off or leaking of investigation secrets to trial participants. To some extent, such an approach is necessary for finding the truth. Whether the restriction on the right of the defendant to view investigation case files or exhibits is unconstitutional, is currently being deliberated over by the Justices of the Constitutional Court of the Judicial Yuan. For example, Judicial Reform Foundation has set up a project on this, available online at <https://www.jrf.org.tw/articles/300>, accessed 21 November 2018. The Control Yuan has produced a review report, available online at <www.cy.gov.tw/dl.asp?fileName=011261063171.pdf>, accessed 21 November 2018. About the introduction for Art. 156 para. 1 of the CCP, see below 3.2. WANG Jaw-Perng, 2011 at 19–20. Available online at <http://law.moj.gov.tw/LawClass/LawAll.aspx?PCode=K0060044>, officially translated as The Communication Security and Surveillance Act of 14 July 1999 (Status as of 23 May 2018), available online at <http://law.moj.gov.tw/Eng/LawClass/LawContent.aspx?PCODE=K0060044>, accessed 21 November 2018. Art. 18-1 para. 3 of the CSSA. Supreme Court decision 87 taishangzih No. 4025 (最高法院 102 年度台上字第 3254 號判決). In that case, the telephone record was excluded. Supreme Court decision 88 taishangzih No. 233 (最高法院 88 年度台上字第 233 號判決). The Judicial Yuan is one of the five branches of government in the Republic of China as stipulated by the Constitution of the Republic of China. The Judicial Yuan is vested with the power of interpretation, adjudication, discipline, and judicial administration; more information available online at <http://www.judicial.gov.tw/aboutus/aboutus00/english.pdf>, accessed 21 November 2018. The Executive Yuan is the executive branch of the government in Taiwan, headed by the premier. The premier is directly appointed by the president, while other members of the Executive Yuan Council, or Cabinet are appointed by the President of the Republic upon the recommendation of the Premier. In addition to supervising the subordinate organs of the Executive Yuan, the Premier explains administrative policies and reports to the Legislative Yuan (Legislature) and responds to the interpellations of legislators; more information available online at <http://english.ey.gov.tw/cp.aspx?n=0B5424E21E6FF0A5>, accessed 1 November 2018. See LIN Yu-Hsiung, 2013 (I) at 190–91. See references to the (US-American) good-faith-doctrine exception United States v. Leon, 468 US 897 (1984). See ZHU Shi-Yan, 2015 at 161. It states that the interrogation of a defendant by police shall, in principle, not proceed at night; exceptions are (1) express consent by the person being interrogated, (2) identity check of the person arrested with or without a warrant at night, (3) permission by a public prosecutor or judge, or (4) in case of emergency, see Annex. Supreme Court decision 100 taishangzih No. 4577 (最高法院 100 年度台上字第 4577 號判決). The introduction for Art. 156 para. 1 of the CCP, see below 3.2. Supreme Court decision 98 taishangzih No. 6024 (最高法院 98 年度台上字第 6024 號判決). E.g. Supreme Court decision 104 taishangzih No. 3936 (最高法院 104 年度台上字第 3936 號判決). Supreme Court decision 100 taishangzih No. 4163 (最高法院 100 年度台上字第 4163 號判決). Supreme Court decision 99 taishangzih No. 1893 (最高法院 99 年度台上字第 1893 號判決). 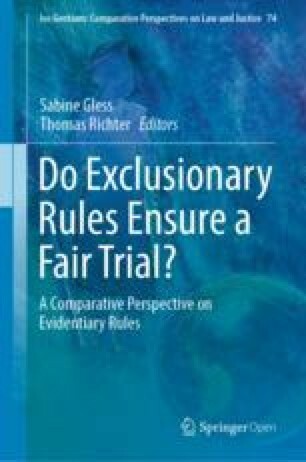 According to the current law, when the procedural rules are violated, two forms of evidence exclusionary rules exist: obligatory exclusionary rules and relative exclusionary rules. See above 3.1. Supreme Court decision 98 taishangzih No. 1495 (最高法院 98 年度台上字第 1495 號判決). ZHU Shi-Yan, 2015 at 158. Supreme Court decision 102 taishangzih No. 3254 (最高法院 102 年度台上字第 3254 號判決). “人權保障及公共利益之均衡維護, 如何求其平衡, 因各國國情不同, 學說亦是理論紛歧, 依實務所見, 一般而言, 違背法定程序取得證據之情形, 常因個案之型態、情節、方法而有差異, 法官於個案權衡時, 允宜斟酌 (1) 違背法定程序之情節。(2) 違背法定程序時之主觀意圖。(3) 侵害犯罪嫌疑人或被告權益之種類及輕重。(4) 犯罪所生之危險或實害。(5) 禁止使用證據對於預防將來違法取得證據之效果。(6) 偵審人員如依法定程序有無發現該證據之必然性及 (7) 證據取得之違法對被告訴訟上防禦不利益之程度等各種情形, 以為認定證據能力有無之標準, 俾能兼顧理論與實際, 而應需要。”. LIN Yu-Hsiung, 2013 (I) at 616–17; ZHU Shi-Yan, 2015 at 166–67. Supreme Court decision 93 taishangzih No. 664 (最高法院 93 年台上字第 664 號判例). 公民與政治權利國際公約及經濟社會文化權利國際公約施行法. The text is available online at <http://law.moj.gov.tw/Law/LawSearchResult.aspx?p=A&k1=%E5%85%AC%E7%B4%84%E6%96%BD%E8%A1%8C%E6%B3%95&t=E1F1A1&TPage=1>, official English translation at <http://law.moj.gov.tw/Eng/LawClass/LawContent.aspx?PCODE=I0020028>, accessed 21 November 2018. For more information, see below 3.2.7. ZHU Shi-Yan, 2015 at 175. LIN Yu-Hsiung, 2013 (I) at 191. Supreme Court decision 104 taishangzih No. 3052 (最高法院 104 年度台上字第 3052 號判決). The extraordinary appeal, according to Chapter VI of the CCP, is a special relief litigation procedure filed with the Supreme Court by the Prosecutor General of the Supreme Prosecutors Office for a conclusive criminal judgment on the grounds that the judgment in question was made contrary to the law. Thus the object of an extraordinary appeal is to obtain a conclusive criminal judgment or an arbitral award which has substantially the same effect as a sentence of inflicting punishment, provided that the judgment or litigation procedure is against the law. More information available online at the homepage of the Supreme Prosecutors Office <http://www.tps.moj.gov.tw/ct.asp?xItem=31768&CtNode=12112&mp=096>, accessed 21 November 2018. Supreme Court decision 104 taifeizih No. 212 (最高法院 104 年度台非字第 212 號判決). Supreme Court decision 99 taishangzih No. 3168 (最高法院 99 年度台上字第 3168 號判決). Supreme Court decision 91 taishangzih No. 2908 (最高法院 91 年度台上字第 2908 號判決). Supreme Court decision 100 taishangzih No. 4430 (最高法院 100 年度台上字第 4430 號判決). With reference to Art. 98 of the CCP, see above 3.2.1 and 3.2.3.1. Officially translated as State Compensation Law of 2 July 1980 (Status as of 2 July 1980), available online at <http://law.moj.gov.tw/Eng/LawClass/LawContent.aspx?PCODE=I0020004>, accessed 21 November 2018. Officially translated as Law of Compensation for Wrongful Detentions and Executions of 11 June 1959 (Status as of 11 July 2007), available online at <http://law.moj.gov.tw/Eng/LawClass/LawContent.aspx?PCODE=C0010009>, accessed 21 November 2018. YANG Yun-Hua, 2014–7 at 3–4. Supreme Court decision 102 taishangzih No. 4177 (最高法院 102 年度台上字第 4177 號判決). LIN Yu-Hsiung, 2013 (I) at 25–26; ZHU Shi-Yan, 2015 at 645. See Art. 4 of the Act to Implement the International Covenant on Civil and Political Rights and the International Covenant on Economic, Social and Cultural Rights. LIN Yu-Hsiung, 2013 (I) at 26. E.g. Interpretation Nos. 392 (The “court” provided in Article 8 of the Constitution does not include the “prosecutor’s office”, hence not empower the prosecutor to detain a person beyond the 24-h period as authorized by said Article for the court. ), 582 (the relevant precedents holding that a statement made by a criminal co-defendant against another co-defendant may be admissible are unconstitutional.). <https://www.moj.gov.tw/mp-001.html>, accessed 21 November 2018. <http://www.judicial.gov.tw>, accessed 21 November 2018. <http://jirs.judicial.gov.tw/Index.htm>, accessed 21 November 2018. <http://fyjud.lawbank.com.tw/index.aspx>, accessed 21 November 2018.